Since moving into our new home, my husband and I both have issues drinking city water. So that brings us to drinking much more bottled water and filtered water. I have a hard time buying different bottled water brands though, I have watched many videos about how and where bottled water actually comes from. So, I was offered Essentia water to try. I was so excited. I started immediately researching this water. I wanted to know more about it. And I found some great facts. With a blend of electrolytes, this water has fast permeation into the body for optimum alkaline health benefits. According to athletes, this water absorbs faster, so you don't have that swishing feeling in your stomach. This water is flouride free. This comes from the USA. So, my big thing is when I am going for a walk or a jog, that swishing feeling. I put this water to the test. It was much better then when I drink my everyday filtered water. I even was rocking my son in our rocking chair. Which typically, I can feel the liquids in my stomach. 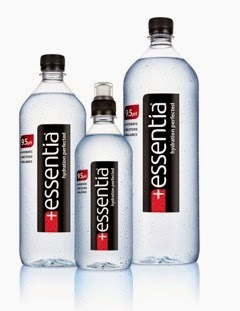 With Essentia water, I didn't have such a huge issue. As for taste? Well it tastes like water. It doesn't taste like our chemical filled city water. It taste just how water should. If you would like to know more information about Essentia, please click here.